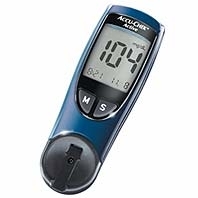 The Accu-chek Active Meter has been discontinued. The Accu-chek meter range now consists of Accu-chek Aviva and Accu-chek Compact plus. If you have one of the discontinued meters please do not worry. Accu-chek Active test strips and Softclix lancets are still available. 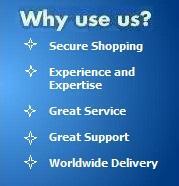 Instead of the Accu-chek Active we would advise the Accu-chek Aviva as a better model and a good replacement. If you sign up to the newsletter below and you could receive some great offers on Acitve supplies or on a replacement glucsoe meter such as the Accu-chek Aviva. If you would like to receive money saving special offers for Accu-chek Active supplies & diabetes testing then sign up to our newsletter & special offers bulletin and receive our latest emails each month. Apply the sample to the Accu-chek test strip in or out of the meter. 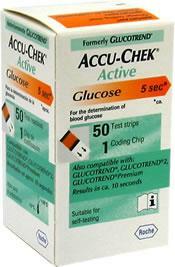 The Accu-chek Active meter turns on automatically when a test strip is inserted. Results in approximately five seconds. Just insert a test strip and get results in two simple steps.  200-value memory with time and date.  7- and 14-day averages. Unlike some other models on the market all our Accu-Chek Active Meters come with a finger pricking device, lancets, Test Stripsand control solution, eveything you need to get started.